Of course, I highly recommend that you try them all! Mueller's is my favorite ice cream parlor in Chincoteague. The Victorian house provides a unique atmosphere and is beautifully decorated. The ice cream was good and the service was outstanding. The father-son team who waited on us were incredibly friendly and funny. They were bantering back and forth about where to hang a sign for a peach waffle sundae that looked amazing. A freshly baked Belgian waffle topped with vanilla ice cream, fresh local peaches and loads of whipped cream. Luckily for my waist, I just ordered regular ice cream. 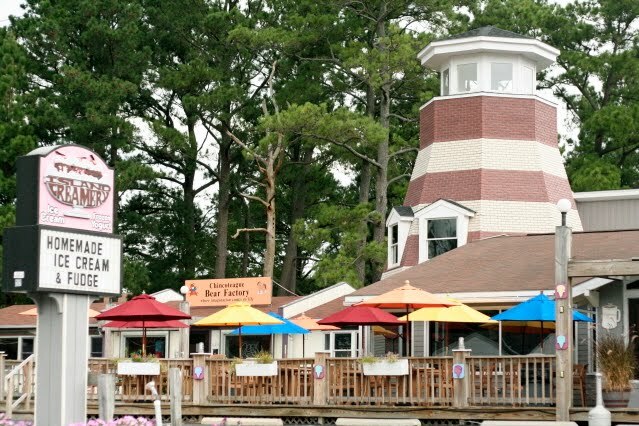 The classic Chincoteague hot spot for cool treats is the Island Creamery. This place always has a line going out the door, but it it's worth the wait. The ice cream is home made in Chincoteague. So good! 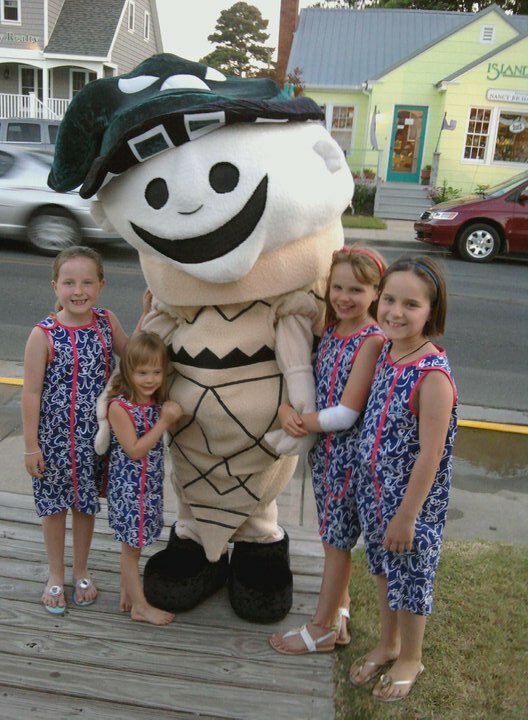 The third Chincoteague classic for ice cream is Mr. Whippy. Yes, Mr. Whippy is his name. My minnies got to meet poor Mr. Whippy who was probably wilting from the 90 degree heat on the 4th of July. This ice creamery is soft freeze and was the original "ice cream man" on the island. You have 4 daughters?! WOW! I am sure your medal is being engraved right now! I only have the twins! The other two minnies are friends. I actually always wanted a ton of kids. 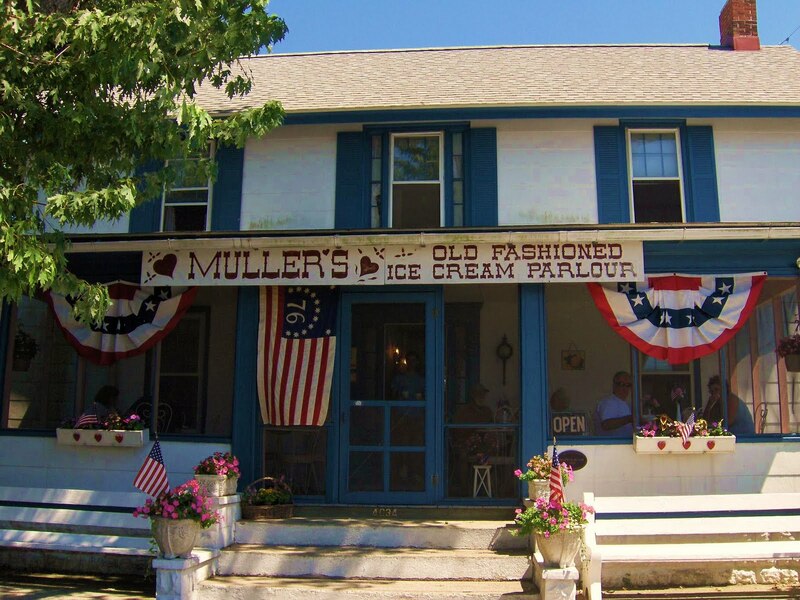 There is nothing better than an old time ice cream stand! Love the girls' matching dresses - too cute! Ice cream is the best in the summer. Love the girls dresses. Adorable! What adorable girls you have. We have a lot of ice cream places in New England too. Nothing better in the summertime! OHHHH I love it!! Love an old ice cream parlor and your minnis' are precious!! Look at all those dresses!! LOVE.LOVE.LOVE!